Volunteering is a great way for seniors to stay involved, meet new people, and improve their health. The emotional benefits are often the first to come to mind: volunteering can lead to a sense of feeling useful, of partaking in meaningful work. Participating in your community can be an important avenue for being connected to others and a bigger purpose. There are also physical benefits. Simply by maintaining a routine that includes getting up and going to a specific activity each day or week, seniors avoid falling into a sedentary lifestyle and social isolation. Often residents receive other physical benefits that strengthen their fine and gross motor skills as they are knitting, sewing, crocheting, and participating in other craft projects. Volunteers are able to continue their efforts and contributions and derive satisfaction and emotional well-being from their volunteer experience. One such program offered to residents at several Mercy Housing properties includes craft clubs where residents may come together and share their time, talents, skills, and experience while using donated sewing machines, fabric, and other materials as they meet in the property’s community room to create their projects of love for another. Weighted blankets are helping people with anxiety. And, several caring residents living at Mercy Housing properties in Illinois, Wisconsin, and Colorado wanted to help their neighbors, friends, and families by making 3, 5, 7 and 10 pound weighted blankets. Like a firm hug, deep pressure from a weighted blanket acts to calm the person under it, and the added weight sends a message to the brain to release neurotransmitters such as serotonin and dopamine to relax. Weighted blankets can also help people suffering from insomnia. Many people with insomnia also have mental imbalances due to the lack of sleep, so the weighted blanket can not only calm anxiety, but also help you get a better night’s sleep at the same time. Originally, occupational therapists used weighted blankets on children with sensory disorders, anxiety, stress, or autism. However, they are more commonly used now for anyone who is anxious, upset, and possibly on the verge of losing control. 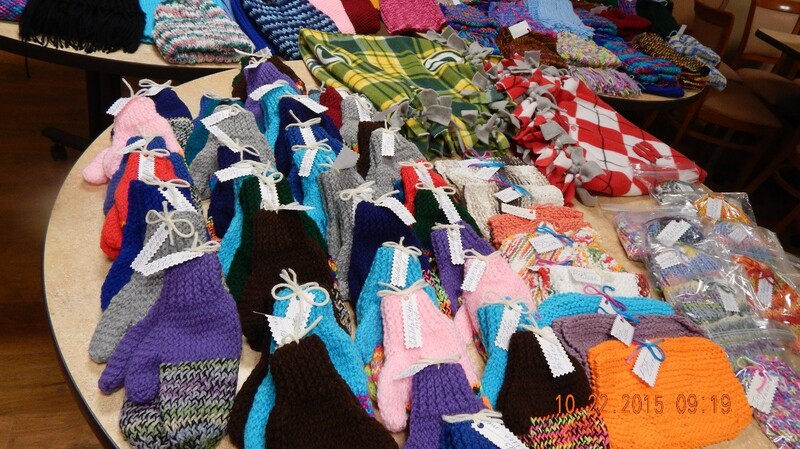 Overall, residents created over 30 weighted blankets, that they lovingly distributed to others. Residents and staff reported how they learned information through their participation in this project that helped their family and friends who experienced symptoms of anxiety and insomnia. The Nifty Knitters, a crafting group from Assisi Homes — Jefferson Court, work together to provide hats, scarves and mittens to a local nonprofit homeless shelter. Recently, they provided over 50 different items to care for their homeless neighbors. Residents have reported that they are grateful and feel fortunate for their home and the services that they receive from the greater community. It is through giving back to others that they receive significant satisfaction and an overall sense of happiness to be able to do something for someone else; often individuals who may never be able to repay this generosity. Crafters also create cancer and preemie caps, mobility tote bags which are attached to walkers or scooters, emotion dolls for children in the hospital, and encouragement cards which are provided to local hospice centers, hospitals, veteran organizations and assisted living and skilled care communities. These cards are created from recycled materials; greeting cards, trivia game cards, stickers and other craft materials. The finished product is used on meal trays to let others know that someone is thinking of them and encourage a smile.